What is this rather unusual plant stand, you ask? And why has it found it's way onto Ananka's Diary? What you see above is no ordinary household accessory. It is, in fact, a robot. 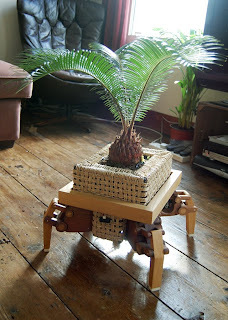 Wherever the sunlight moves throughout the day, the Plantbot follows it. Believe it or not, it's actually really cute. all written by Fiona Dunbar? They are really good books, I own all of them. It's about this girl who has a magic recipe book to solve some problems. The person who provides her with all the weird ingredients gives her weird plants to plant in her own backyard. Some of them talk, and one of them moves out of the soil if the sun bothers it, and walks to a shady area. A perfect combination of electronics and nature. And if it can be modified a bit, it can play music, do your homework, clean your room and bring you choc chip cookies! Also, it's pretty cool how they've used wood and weaving rope/straw stuff to make it look natural. WOW. That whole website is full of the coolest things! But the plant thing -- I love that it was photographed with a cat looking at it warily. I agree with Random Irregular, it's neat how it's made out of wood and stuff. That is VERY cool. Just what my mother needs so she can stop mursering our poor spider plants. That is so cute! And cool! And amazing! And on and on! but yeah. What happens at night when there is no sun? Does the plant robot go berserk and attack your pets?